It is three years since India last reported a case of polio. Patralekha Chatterjee reports on how the country appears to have finally managed to beat the disease. Despite a healthcare system beset by severe problems, India has ushered in the new year with an achievement to be proud of. In 2009, India reported 741 polio cases, more than any other country in the world, according to the Global Polio Eradication Initiative. The last case was reported from the eastern state of West Bengal in 2011, when an 18-month-old girl was found to have contracted the disease. The country faced unique challenges in eradicating polio. Among them was the high population density and birth rate, poor sanitation, widespread diarrhoea, inaccessible terrain and reluctance of a section of the population, notably members of the Muslim community in certain pockets, to accept the polio vaccine. Nicole Deutsch, head of polio operations in India for UN children's charity Unicef, said: "Despite these obstacles, India proved to the world how to conquer this disease: through the strong commitment of the government, seamless partnership comprising the government, Rotary clubs, WHO and Unicef, and above all the tireless hard work of millions of front-line workers - vaccinators, social mobilisers and community and health workers - who continue to implement innovative strategies to rid India of polio,"
The introduction of bivalent oral polio vaccine in 2010 also helped India to battle the disease. Previously, India had been using a monovalent vaccine that protected only against type 1 poliovirus transmission, not type 3. which was causing repeated disease outbreaks. But it was organisation that was key in enabling India to cover the last mile in its battle against polio. In a vast country of more than a billion people who are culturally, economically, linguistically and socially diverse, "micro-plans" helped because they tossed up precious data about the specifics of a particular place - areas to be covered by each vaccination team on each day of the immunisation campaign, names and designations of the vaccinators, supervisors and community workers assigned to the area along with the vaccine, logistics distribution plan and so on. But data alone did not deliver results. Unicef set up the Social Mobilisation Network for polio in 2001 in northern Uttar Pradesh state. The initiative was a response to resistance against the polio vaccine. Families were refusing to immunise their children in some districts in Uttar Pradesh. There were many reasons why this happened - parents did not see polio as a risk; repeated immunisation rounds had created doubts in their minds; and some believed rumours that linked the polio vaccine to impotency. The Indian government and its polio partners realised that a new approach was needed. This led to strategies to make polio vaccination more acceptable among people who had been resisting it. Children who suffered from severe bouts of diarrhoea did not fully benefit from the oral polio vaccine. So, community mobilisers started talking about the need for hand-washing, hygiene and sanitation, exclusive breastfeeding up to the age of six months, diarrhoea management with zinc and oral rehydration therapy, and routine immunisation, necessary to sustain the success of polio eradication. This holistic approach has paid off. India's polio campaign gathered momentum when it focused on marginalised and mobile people, and began working in earnest with religious leaders in Muslim communities to urge parents to immunise their children. For example, in Bihar in eastern India - once a polio hotspot in the country - a key focus of the polio programme is migrants. In recent years, continuous vaccination has been conducted at 51 transit locations at the state's international border with Nepal and 11 important railway stations. Bihar also saw special drives during popular festivals and fairs. While India appears to have stopped indigenous transmission of wild poliovirus, the risk of importation is real and has increased since 2013 with outbreaks in the Horn of Africa region and the Middle East, in addition to the continuing poliovirus transmission in Afghanistan, Pakistan and Nigeria. "India needs to stay extremely vigilant and continue its efforts to ensure that the children remain protected against polio, until the disease is eradicated globally," said Nicole Deutsch of Unicef. 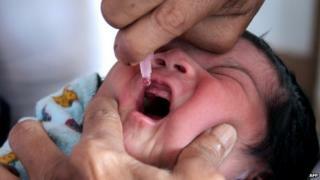 "India plans six polio campaigns in 2014 and 2015. In each campaign, 2.3 million vaccinators will immunise nearly 172 million children." India has also set up polio immunisation posts along the international borders with Pakistan, Nepal, Bangladesh, Burma and Bhutan to vaccinate all children up to the age of five years crossing the international borders. India's dramatic turnaround paves the way for polio-free certification of the entire South East Asia Region of the World Health Organization. The South-East Asia Regional Certification Commission for Polio Eradication (RCCPE) is expected to meet in Delhi in the last week of March 2014. "If the commission is convinced that there is no wild poliovirus in the region and the surveillance quality is good enough to pick up any wild poliovirus and phase 1 laboratory containment work has been completed, it will certify the South East Asia Region of WHO as polio-free," a WHO spokesperson told the BBC. India's successful control of polio has had other benefits. A health ministry official connected with India's National Polio Surveillance Project (NPSP), a collaboration between the government and the WHO, said strategies that worked in the case of polio were now being used to push up routine immunisation. This is good news. Too many Indian children still die because they do not get the vital vaccines. Patralekha Chatterjee is an independent Delhi-based journalist.